No tourists have ever been allowed into the uncharted Southern Jordanian Desert - until now. Desert Discoveries gives travellers the unique opportunity to explore areas where no western tourists have ever been, whilst learning first-hand about the extensive history of Jordan and the region. 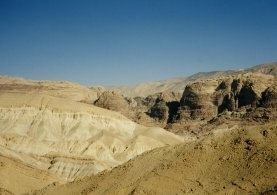 With the co-operation of the Jordanian authorities, unexplored areas of the Jordanian Desert have been opened exclusively to Desert Discoveries Limited, an independent UK-based travel company, to take small groups of people to explore the desert by day and sleep under the stars by night. 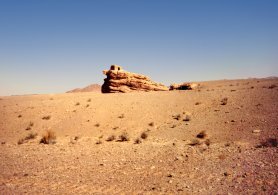 Antonia Willis, founder of Desert Discoveries, and co-director Diana Beatty, lead the Desert Discoveries team deep into uncharted areas of the Southern Jordanian desert, which is full of undiscovered ancient history. As both Antonia and Diana have a passionate interest in Jordanian archaeological history, they will reveal unexcavated sites that they and others have discovered, and they will explain survey methods used to chart new sites. In order to reach remote areas, special permission has been granted to spend nights in the open, deep in to the Jafr salt flats area. The itinerary also includes more popular sites, such as the ancient city of Petra; the King's Highway, Jordan's main trading route since the Bronze Age; the ancient rock drawings of Rum; and the little-known ruins of Humeima, a city founded by the Nabataeans and incorporating structures from Roman, Byzantine and early Islamic times. Travelling is mostly in air-conditioned, 4-wheel drive vehicles, which are necessary to cope with the heat and terrain, such as deep sand drifts, undulating dunes, and basalt flints and boulders. The driving and tour security is in the hands of recent British ex-S.A.S. personnel who have experience in the challenges associated with driving, navigating and sleeping in the open, uncharted desert areas. Not all of the nights on tour are spent under the stars, some are spent in luxury hotels in Amman and Petra. Desert Discoveries takes only six to twelve people per trip, and operates three or four trips a year. Desert Discoveries, based in London, is proud to be the only travel company able to offer this package, and actively works to promote responsible tourism in Jordan.